Four big plants in Australia are stranded assets. Earlier this year, during India’s deepest drought in decades, local authorities in central Maharashtra reported the highest rainfall deficit in the country. Water levels behind dams dropped so far that reservoirs had bathtub rings of dried sand and mud. Puddles lay at the bottom of seven dams in the region, including the Jayakwadi Dam in Aurangabad, one of Asia’s largest earthen dams. On the other side of the country, in the state of Tamil Nadu, water providers in Chennai, a city of 8.2 million residents, coped with contamination from overpumping the region’s groundwater and from a horrific flood that covered much of the city last December. Past efforts in Australia to increase capacity are a cautionary tale of growing too big too fast. Four large facilities built in the waning years of a national drought emergency sit idle today. These incidents of severe clean water scarcity, emerging on both Indian coasts and in the country’s second and sixth largest states, sowed fresh anxiety about water security and revived India’s on-again, off-again national debate about building more desalination plants to convert seawater to drinking water. 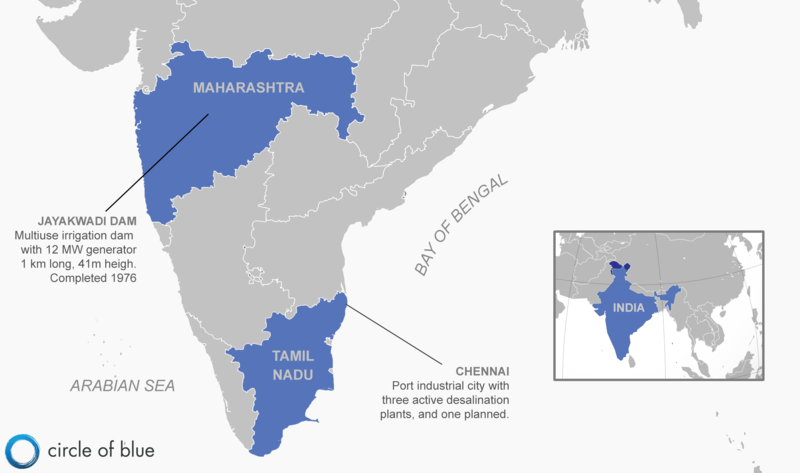 India is not the only country in which coastal cities are mulling a desalination expansion. China and the Middle East are hot markets too. But past efforts in Australia to increase capacity are a cautionary tale of growing too big too fast. Four large facilities built in the waning years of a national drought emergency sit idle today yet they cost ratepayers hundreds of millions of dollars last year in maintenance and contractual charges. Australia’s experience with stranding expensive desalination plants is consistent with what is happening with mega infrastructure projects in mining, oil development, coal production and combustion, pipeline construction, hydropower generation, and shipping around the world. The market, ecological, and social conditions that existed at the start of the project development change markedly by the time they are ready to operate, often a decade or more later. The result is that mega projects to develop, process, and transport natural resources, particularly those that demand ample freshwater supplies, are failing on six continents. Billions of dollars are being lost. Australia’s stranded desalination plants, coupled with huge electrical power demands, largely from fossil fuels, have put the world’s desalination sector on the defensive, especially for developers of the big and expensive seawater plants. About 150 such plants, producing the bulk of desalination capacity, operate around the world. The greatest density of seawater plants is in the Caribbean and the Arabian Gulf states. In no Indian city, and in few other cities around the world, are the considerations about desalination as informed by operating experience or fraught with civic concern about environmental and financial risks as in Chennai. The city has opened two desalination plants since 2010 that produce 200,000 cubic meters (52.8 million gallons) of drinking water daily. That represents about 7 percent of the total municipal water supply. A third smaller desalination plant, opened in 2007, provides freshwater for a local refinery. The city is now considering bids to build a fourth and much larger $US 208 million plant capable of producing 150,000 cubic meters (40 million gallons) of drinking water daily. A fifth desalination plant is proposed that would supply up to 400,000 (106 million gallons) cubic meters daily. In aggressively tapping the sea as a source of fresh water, city authorities assert they are taking pragmatic steps for assuring adequate supplies with a proven technology. The program has gained the strong support of Tamil Nadu Chief Minister A. Jayalalithaa, who has recruited international financing for the plants. The fourth plant will be financed by a German bank. Japanese financiers have expressed interest in paying for the fifth. Critics of the Chennai plants raise several issues. Cost-conscious city residents say that the construction price tag and ongoing operating expenses will drain funds for investment in other public projects. They also worry about the plant’s energy consumption, from electrical generating stations fueled by carbon-heavy coal. Every cubic meter of seawater converted to fresh water requires three to five kilowatt hours of electricity, making desalination the most expensive source of fresh water and a fountain of climate-changing emissions, which are much of the cause of the region’s hydrologic instability. Thakkar’s view is shared by prominent water supply authorities on other continents. The Pacific Institute, the Oakland-based water research group in the United States that is affiliated with Circle of Blue, has published several studies that found that not only is seawater desalination expensive, the salt-laden discharges from the plants also harm marine environments. Santa Barbara, California built a desalination plant to respond to a late 20th century drought. Ample rainfall resumed in 1992, when the plant was finished. It was mothballed four months after it began operating. Big desalination plants also are a risk for becoming a stranded asset. A $US 100 million plant built near Brockton, Massachusetts has never operated effectively because of adequate water supplies from other sources. The high price of treated water also deterred consumers. The plant is opened episodically then closed for long periods of time. Brockton is considering purchasing the plant to save on maintenance costs. Santa Barbara, California built a desalination plant to respond to a late 20th century drought. Ample rainfall resumed in 1992, when the plant was finished. It was mothballed four months after it began operating. Last year the city approved a plan to spend $US 55 million to bring it back online in response to the region’s five-year-old drought. The plant could restart by January 2017. In the Arabian gulf, where many of the world’s largest desalination plants operate, environmental scientists worry about the rising share and cost of national natural gas and oil production that is used to convert seawater to fresh water, as well as the saline-rich discharges into the gulf, which is getting saltier. Following a cruel 12-year drought in Australia that ended in 2010, national authorities launched an aggressive program of desalination development in big coastal cities. Almost $US 10 billion was invested in four big desalination plants in Sydney, Adelaide, Melbourne and Brisbane. The Melbourne plant alone cost $US 4 billion, the most expensive reverse-osmosis desalination facility in the world. Rainfall returned to normal levels. Reservoirs filled. None of the four are operating, and ongoing maintenance cost Australian homeowners and businesses $US 1 billion this year, according to the Labor government. The National Center of Excellence in Desalination Australia, the government-sponsored research group that assisted much of the development, closed in July. Supporters of the Australia program say the investments provide a level of comfort in the event of the next big drought. They also assert that two desalination plants were opened in Perth, the first in 2006, the second in 2011, and supply half the city’s drinking water. During the United Nations climate summit in Paris last year 80 desalination industry developers and practitioners announced the start of the Global Clean Water Desalination Alliance. The group’s goal is to pursue new technology, especially to incorporate renewable energy as the desalination power source. A demonstration plant powered by solar power is close to completion in Saudi Arabia. Laboratories around the world are experimenting with an array of electrical sources and new desalination techniques to reduce expenses and carbon emissions. Due to the increasing global demand for fresh water the amount of energy used in the water sector will more than double by 2025. Because a big desalination plant, like the one that opened last year near San Diego, can require 40 megawatts of electrical generating capacity, the need for less polluting electrical power is urgent. This month the International Energy Agency projected that due to the increasing global demand for fresh water the amount of energy used in the water sector will more than double by 2025. Most of the increased demand, said the agency, comes from desalination. By 2040, the IEA added, desalination projects will account for 20 percent of water-related electricity demand globally. The International Energy Agency’s findings reflect the immense size and reach of the desalination industry. In the year that ended on June 30, desalination capacity increased 16 percent or 3.7 million cubic meters per day (1 billion gallons), according to the 29th Worldwide Desalting Inventory, published by GWI DesalData in association with the International Desalination Association. Seawater desalination accounted for 1.6 million cubic meters per day of the new capacity, an increase of 14 percent from the previous year. The industry counts 19,000 operating desalination plants around the world that produce 88.6 million cubic meters (23.4 billion gallons) of fresh water daily. Most of the plants were built since the early 1970s.